RAF Changi competition to win a 1951 Humber Hawk. Homepage. This page: An interesting raffle ticket which went on to win it's owner a 1951 Humber. An RAF officer wins a Humber in a raffle. Karen got in touch with a question about car registrations, and emailed over these interesting little items that relate to the car she was enquiring about. 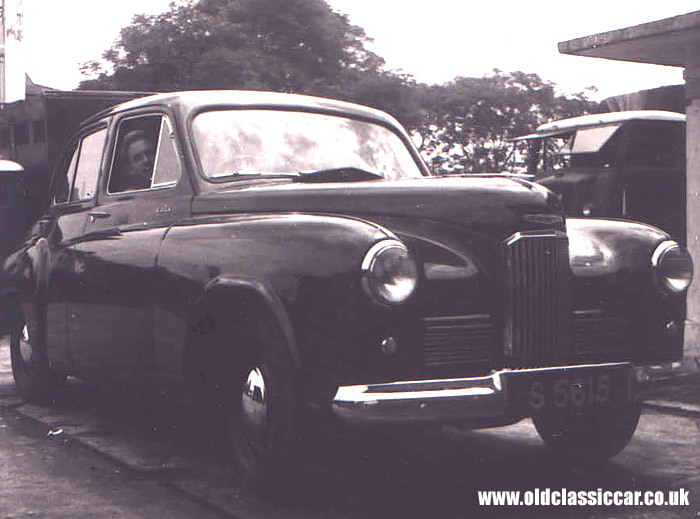 The car was a 1951 Humber Hawk, a car that her father, while serving with the RAF at Changi in Singapore, won in a raffle. He was stationed at RAF Changi from 1952 to 1954, and entered this raffle in 1953. Karen adds: "In the years 1952-1954 my father was stationed at RAF Changi in Singapore. As my Mum found out she was having twins, my Dad wanted to get home and bought a raffle ticket to try and win a Humber Hawk car, which he did. He was then able to buy himself out of the RAF and come home. A brilliant story. I have the raffle ticket and a photo if you are interested. 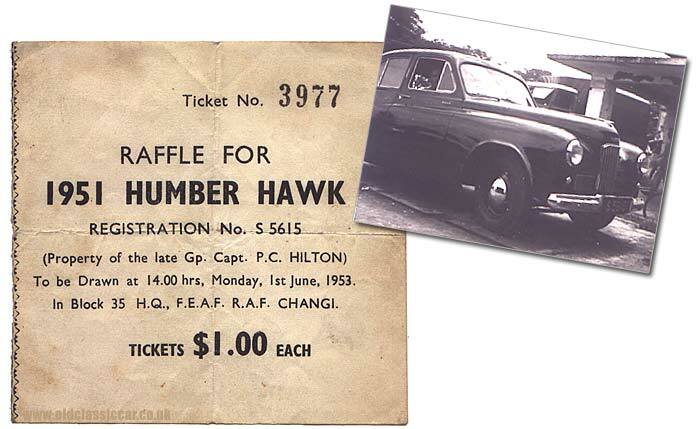 The registration was S 5615 and it says it was for a 1951 Humber Hawk ... On the raffle ticket it says Property of the Late Group Captain P. C. Hilton, Ticket no.3977, to be drawn Block 35 HQ, FEAF, RAF Changi on 1st June 1953 at 14.00 hours. Cost $1.00 each." Thanks so much for sending it over, its amazing that the raffle ticket survives along with photos of the car after so many years. I won if any other former RAF personnel out there remember this competition? Does anyone know more about Group Captain P.C. Hilton, and how his two year old Humber came to be up for grabs presumably following his death? RAF Changi came into being in 1945, on the site of a former British Army base. The RAF remained there until late 1971, when the site was returned to the local population for the princely sum for one Singapore Dollar. Their armed forces went on to use the site, before it was re-developed as Singapore International Airport. A larger photo of the '51 Humber Hawk that Karen's father won can be seen by clicking here. This basic design of Hawk lasted for many years, and some photos of Humber Hawks of the late 1950s can be found on this page. Competitions to win a car are nothing new, and this article sheds light on a raffle held in the early 1930s, to win Austin 12/6 saloons.